The screenshot above should also make it obvious, but if you were wondering if iOS has just received another really good-looking notes app that also sync with the Mac, then the answer is yes. Bear uses simple plain text for all of its formatting, so the notes you type out are easily transferrable — at any time — to any other platform or service. 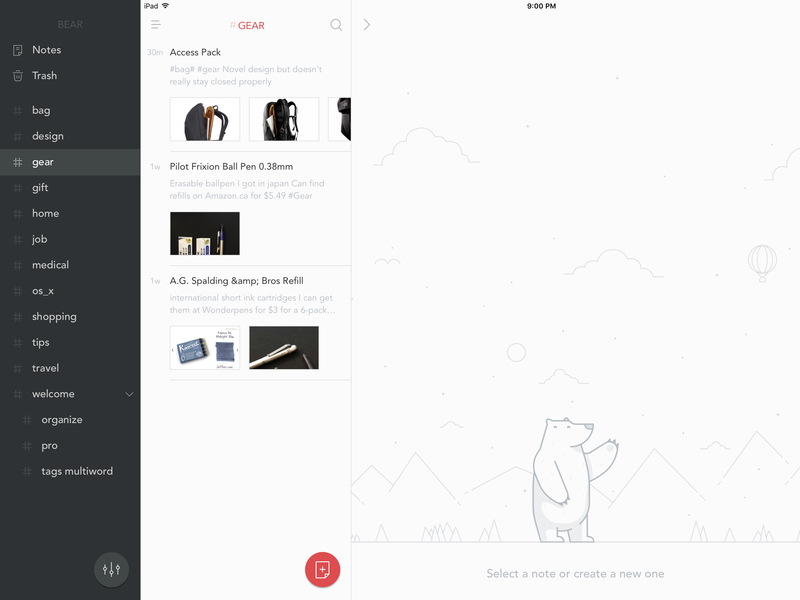 However, just because you’re using plain text, it doesn’t mean your notes have to look plain: Bear also handles rich text formatting with Markdown, and it displays pictures right alongside body text. 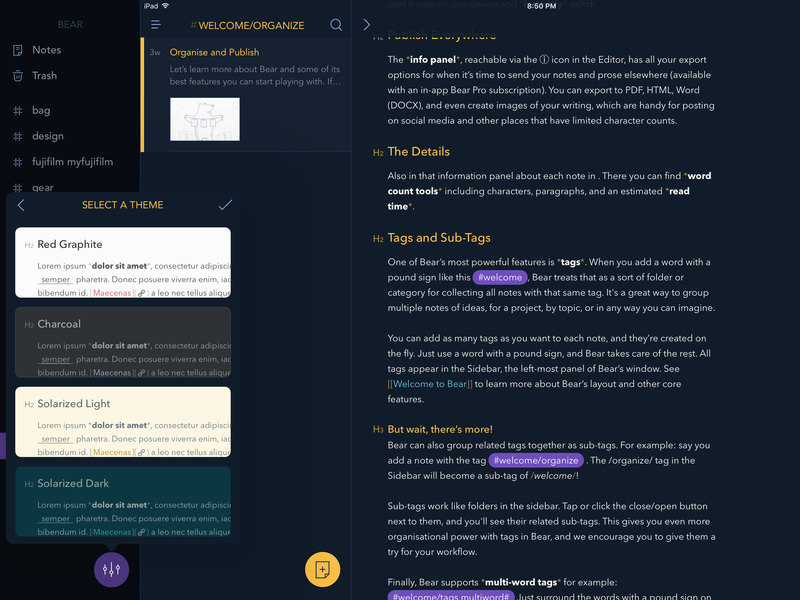 Whereas other plain text tools like iA Writer 4 focus more on being plain text writing machines, Bear feels like it focuses specifically on taking great notes in a flexible format. There are extra writing elements like word counts and read times in the right sidebar, but I’ve definitely become a bit of a snob when it comes to writing apps: without some sort of focus mode to keep text centered, I don’t consider Bear a full-fledged writing app for my purposes. That’s fine though, because in my brief testing period, it feels like a fantastic app for notes. One thing I like about Bear, right off the bat, is that it’s skinnable. There’s no waiting period for a suitable dark mode: there are six great themes, although a few of them are available to Premium subscribers only (more on this later). Reskinning a note-taking app isn’t just a superficial change; I think it fundamentally changes how usable that app becomes during different periods of the day. Even though I use it as my full-time notes service, Evernote can be very uncomfortable to look at when you wake up at 2am in the morning and just need to write down a quick note. The fact that Bear can keep a dark background with coloured text is a real plus for me, given how often I type out little random thoughts on my iPad. I can access all of my tags by pulling up Bear’s sidebar, where they’re all conveniently sorted in alphabetical order. This app uses tags in much the same way as Vesper and Simplenote do: you can have several tags on a single note, and you can search for a note by stacking several tags (e.g., searching for #bag, #gear and #leather to find a note about a leather bag I liked). I haven’t used Bear for very long, but I did import my notes from Evernote into the app to trial it with a real life set of data. I don’t have any folders for notes, but I vastly prefer tags to folders for organizing large numbers of files, so I agree with Bear’s design decision here. You have to pay a monthly ($1.49 USD) or annual ($14.99 USD) subscription for Bear, in order to get all of the best features (cross-device sync, extra themes, export options). I’m not sure that I’ll be subscribing to Bear, but I do think of this as a plus. By having a set of regular subscribers, it seems to me that Bear will have a much higher chance of sticking around and receiving future updates. I also think these pro features are well worth it. If you think of Bear’s subscription like the cost of replacing a few notebooks over the course of a year, then it’s a really good deal (and it should be pointed out: paper notebooks don’t sync or respond to Markdown). 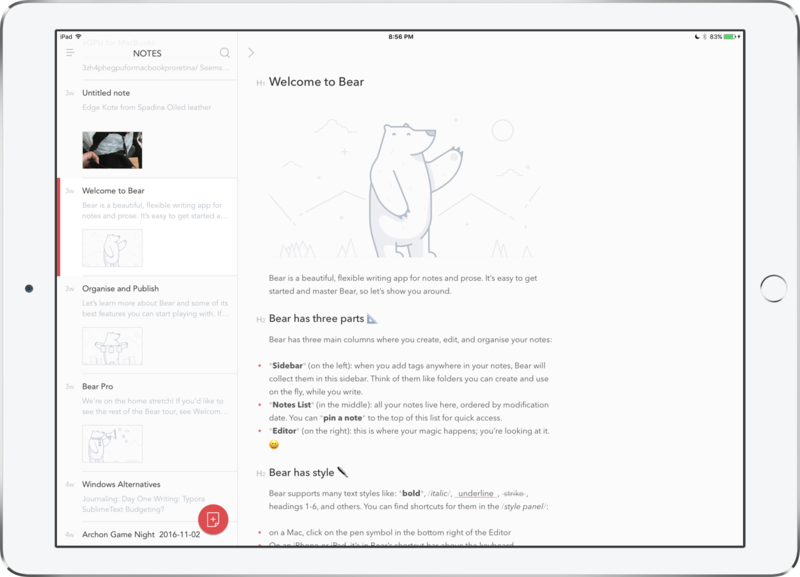 The only thing that has me on the fence about moving to Bear from Elephant — I mean Evernote — is the fact that it’s iOS and macOS only. I do have the good fortune of being allowed to choose which primary operating system I want to use at work, but I don’t know if that will always be the case, and I really like knowing that I can have my notes with me on any platform I’m using. If Bear launched a web app later on down the line, or found a way to release a dedicated Windows client, I’d be all over this service in a heartbeat.